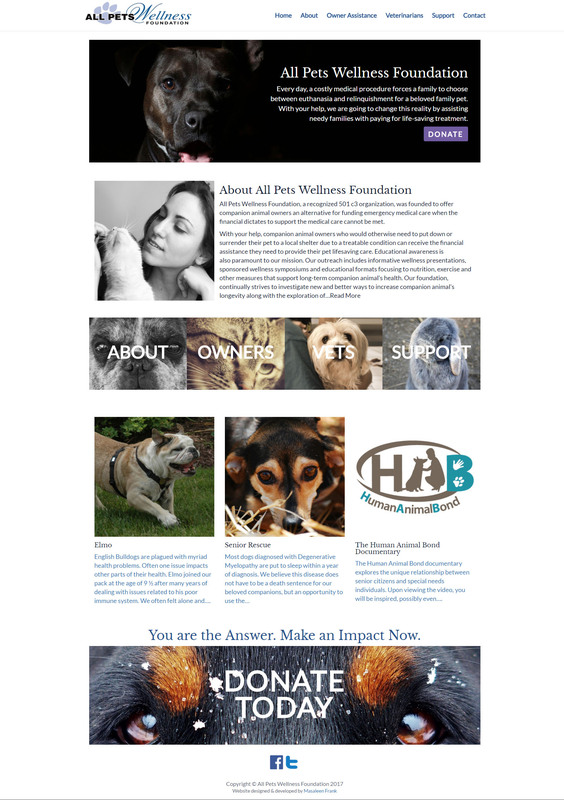 I was chosen to design and develop a new website for All Pets Wellness Foundation, a non-profit founded to provide funding for pet owners who can’t afford life-saving medical treatment for their pet (how nice is that?). The new site is now live at allpetswellnessfoundation.org! Adobe XD is a very new program created specifically for web designers, so new there’s still only a Beta version. I was recommended by a digital marketing agency to learn it, and I definitely see its potential. This was the first WordPress theme designed entirely from scratch, and much of the development involved self-teaching new skills including Adobe XD, Bootstrap, mobile-first design, and GitHub. I faced many challenges in ensuring responsiveness, precision, and an intuitive, pleasurable visitor experience. While the result is not extravagant, it is a clean, functional, beautiful website that will hopefully serve well in aiding many ailing pets!